Zerfall oder Wiedergeburt? 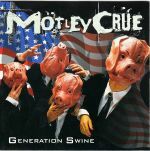 Wollen wir froh sein, dass Vince wieder im Boot ist, auch wenn "Generation Swine" nicht gerade das ist, was man von Mötley Crüe erwartet. I knew this album was going to be terrible but listening to it overtime got me thinking this is an okay album. Afraid is my favourite, some tracks are okay and some tracks are bad.